I'm blaming (once again) the lack of free wifi in Australia for a gap in this blog, which has left me without a resource for a story I need to write. Maintaining TravelSkite is an unrewarding occupation: financially, of course - the thought that I could actually earn money from it is laughable - but, more meaningfully, in terms of feedback from the people who read it. I know I have some regular readers, but you swoop in and out from your various exotic locations without ever leaving a comment, sniff, and I never know if I've amused, interested, informed or bored you. So the main purpose of the blog is simply to record events and personal impressions, and to act as a memory-jog when I'm back home writing up the stories. 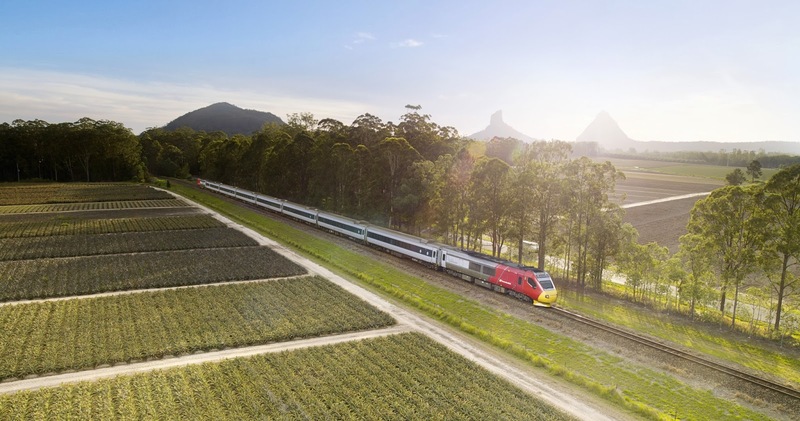 And not having free wifi hampers that process, with the specific result today that apart from my trusty 3B1 notebook and photos, I'm scraping for inspiration about the trip I took in November from Brisbane to Townsville on the newly reincarnated Spirit of Queensland train. It runs all the way to Cairns, which at speeds of up to 160kmh takes 25 hours, but the bit I did took from 3.45pm till 9.45am. I travelled in the RailBed class, and recommend it as a very comfortable way to get through the night. Not as comfortable, it must be said, as Platinum Class on the Ghan, which gives you a private cabin with an ensuite and a cushy double bed that folds down - RailBed is less First Class, more Business Class, in aeroplane terms. The seats are pretty much what you'd find when you turn left on any airline these days: pods with lots of legroom, a big screen on the seatback in front, a firm but adequate fold-down bed with good quality bedding, and most of the service pluses you'd get at 30,000 feet. Minus the liberal hand with the wine, but plus big windows and scenery, and a huge public bathroom with a shower. Pleasant meals on a tray at your seat, safety announcement just like on a plane, amenities pack, leather and woodgrain... all very nice.